Bigasoft M4A Converter provides ultimate solution for M4A decoding and encoding. It can convert M4A to a variety of audio formats like convert M4A to MP3, WAV, OGG, AAC etc. as well as convert to M4A from any popular video and audio formats including MP4, AVI, MOV, MKV, MTS, TS, MOD, MP3, FLAC, WAV, RA and more. 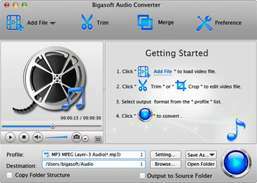 Convert audio files to other formats. Convert audio files to mp3 format easily.